Really suddenly. Sort of unexpectedly. Don’t get your feathers in a ruffle. I’m not pregnant and have zero plans to be. No, what “it” is, is something else. I finished my book. Yes, it’s true. In case you’ve been reading this blog for some time you’ll know that I have been working on this book since…well…a long time ago. It’s been a very bumpy road getting here, including having to write an entirely new book for my agent. Well, 2 years, a natural disaster, a baby, postpartum depression, and a whole laundry list of other crap later, I have a finished draft. I’m not quite sure how to feel about this. I was a little emotional at first. This story and these characters have been swimming around my head, fighting with me, growing on me, for a very long time. It’s like sending your kid off to boarding school. I sent the draft to my editor and was overcome with anxiety. I was terrified that she would tell me that my contract had become void because I had taken too long to produce anything, or that she was just going to tell me that it was complete crap. She e-mailed me back the next morning asking for a synopsis of the manuscript and told me she’d get to reading as soon as she could. Which means now…I wait. It’s not the end of the world, the waiting. So far. I’m enjoying the time “off” from having to think about it, stressing over how to finish the stupid thing, stressing over whether or not it’s any good or if it makes sense. My editor can decide that and we can go from there. In the meantime I’m tinkering with some new ideas to save for later. And packing. Right. Because we move next week. Because I felt like writing but at the same time wanted to procrastinate working on the book. Funny how that works. This week we got quite a few things for Celia. 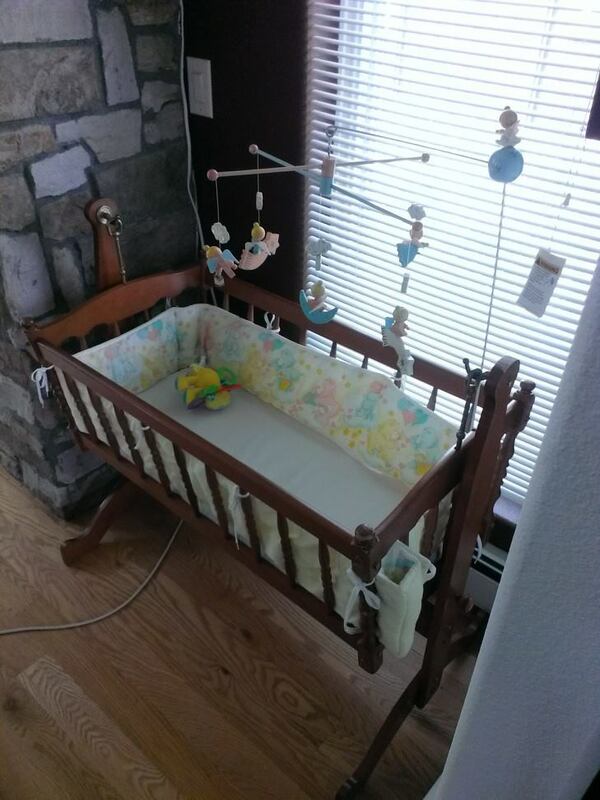 Our neighbor called us last week and said they were having a yard sale and that they had a cradle for sale, so we went over to take a look. I snapped it up as soon as I could. It was used for 3 kids since the late 60s but it’s still in excellent shape. It fits perfectly in the window in the living room, so we now have a place to put Celia down if we’re watching tv or otherwise don’t want to be upstairs. Please don’t warn me about the cable and the shade string. I got it. 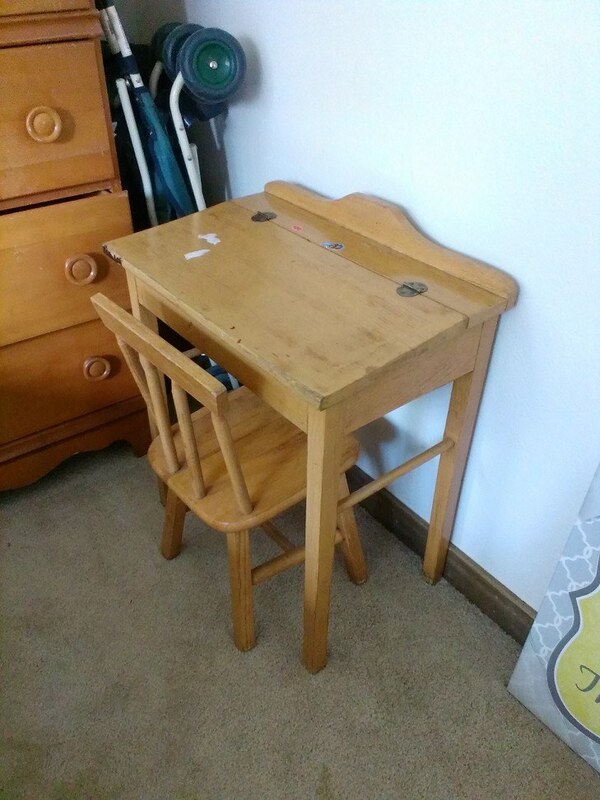 We also snagged a child’s chair and desk, which we thought would be great for once Celia gets a little older, as well as a set of Mr. Potatohead. My mom has a full collection at her house too so Ce is going to be more than set when it comes to Mr. Potatohead. I still feel pretty good all things considered, though I have definitely seen an upswing in heartburn/acid reflux in the last week or so. I have a feeling that I will be moving to the guest bed at some point in the near future, too. Our bed is pretty much the most comfortable thing in the world with a 4″ memory foam topper on it (we call it our cloud bed) but right now it’s almost a little too soft, because I end up getting stuck in certain positions and it’s really hard to move. So, might have to give up and move over to the firm bed in the other room. I don’t think I’ve slept through the night in at least a few weeks. Still able to tie my shoes…but probably not for long. Lately my mom has been pressuring us to pick out a middle name for Celia, which is not going well (or as quickly as she’d like I’m sure). She’s being very persistent in sending me lists and lists of names, but only 1 out of 10 do I like. Thing is, Cameron and I took so long to come up with one! Just one! girl’s name that we both liked, coming up with a second is just turning out to be a frustration now, and I don’t want to pick a name just for the sake of picking one. I’m picky–it takes me forever to nail down names for fictional characters, now picking a name for a real person? Forget it. But it’s going to be with her forever (or until she gets married, because she could do like I did and “technically” remove her middle name) and I don’t want to not like it. So maybe she ends up not having one, I don’t know. Seems these days middle names are only useful when the kid is in trouble anyway. I guess it’s just not very high on my list of priorities. I contacted the person at the hospital responsible for signing us up for childbirth classes, so hopefully soon I should get a schedule on when those are. I also finished up the registry and I know baby shower plans are in the works, so things are really moving fast now. I am so eager for autumn to be here. Football! Pumpkin things! Cool weather! And baby! Along with fall I am really eager for the tourists to go home and for things to go back to being quiet. This tends to be a really touchy subject with a lot of people I know here in Estes. There seems to be this overbearing school of thought that we are so lucky to live here that we should like the tourists no matter what. I tend to feel a little more cynical than that. There’s the obvious–traffic is congested, no place to park, nobody knows where they’re going, the supermarket is such a madhouse all the time that I will go 45 minutes away to do my shopping, everything is always packed…that sort of stuff. But maybe more than ever this summer I have felt this terrible sense of isolation being up here, and I know a lot of it has to do with the tourists being here. I spend every evening at home because there’s nowhere in town to go that isn’t inundated with tourists. I can’t go sit in the corner table at Starbucks and work on the book because it’s too busy and distracting. It gets to you after a while. I think another facet of it is I just feel lonely, plain and simple. I haven’t seen any of my friends in months and every attempt I make at trying to get some of them to come visit is met like I’m suggesting they go to the moon, so after a while I just quit making the attempt. Add on top of that my two best friends ever just moved to Baltimore so they can start an amazing new life together (and how hard THAT has been to cope with) and the fact that I don’t have any friends my age up here, and it starts to bug you after a while. I worry often that when the baby comes I will feel even more isolated from my friends–not just by distance but by the entire new lifestyle I will have. But at least by the point when Celia arrives, it will be quiet enough in town that I will be able to walk down to the Starbucks with her and be around Cameron and his employees, all of whom I love, and not be stuck inside the house. In the end, I have to remind myself that we are not in Estes for life, and in a few years we’ll be moving back to Fort Collins (voted one of the happiest places to live in the country, I should point out…) and I can hopefully go back to enjoying Estes the way it is meant to be enjoyed–because I feel bad in saying so but I do resent it from time to time. Anyway! That turned into far more of a vent than I had intended, so here’s something cool. 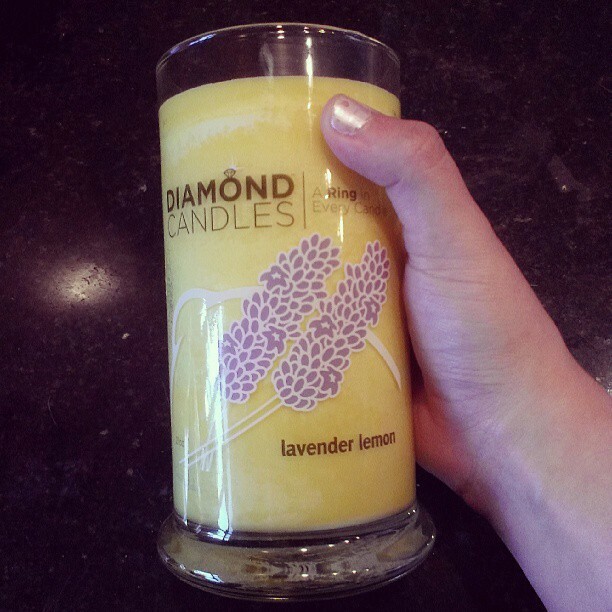 I came across a company called Diamond Candles and ordered one on a whim. I thought, well, it’s not too much more expensive than buying a candle at Yankee, and this has jewelry inside it! So I splurged. My candle arrived on Monday and I promptly set to burning it so I could dig out the treasure. 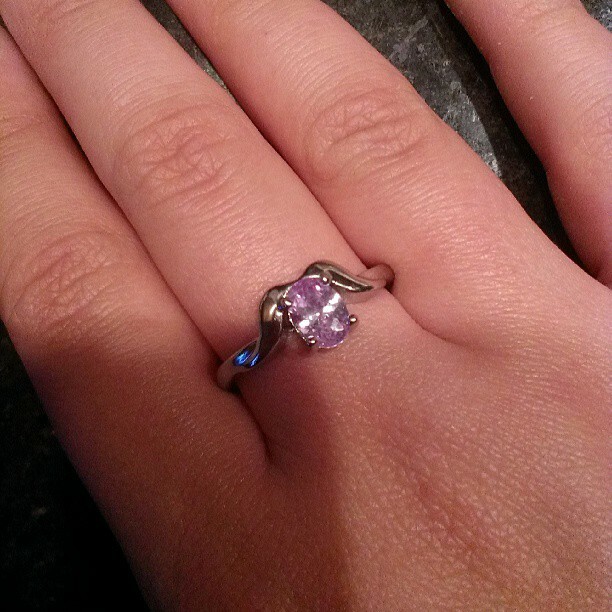 I don’t think the ring is worth anything, but at least it’s really pretty! I’m pretty pleased with the product overall–the candle is way bigger than I thought it would be and it smells fantastic. I hope they put out some fall scents soon because I am definitely not against ordering another. A cool idea overall. And finally, one more piece of silliness. Last week Cameron and I were playing catch in the backyard and he said to me, “try to hit this saw horse with the football from the other side of the yard.” We have a pretty big yard, but I have pretty good aim, so I gave it a shot–and this happened. No joke! 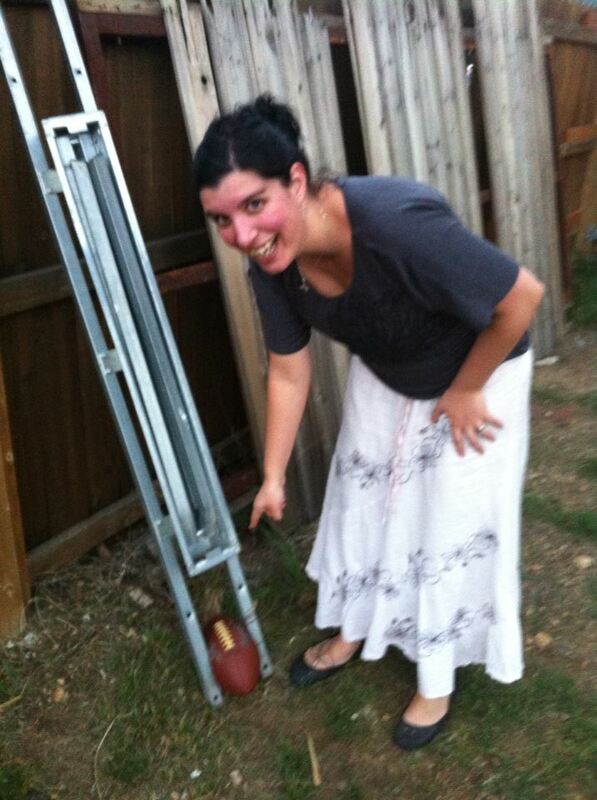 Literally split the uprights. That thing was jammed in there, too. Neither of us could believe it. First try from about 20 yards away. Probably could never do it again if I tried. 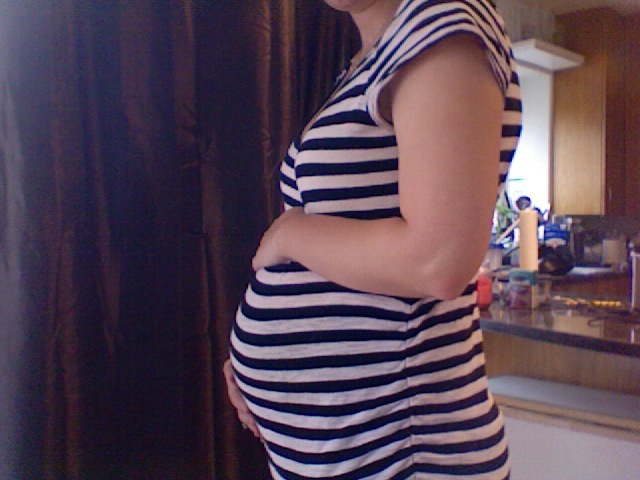 But it did make me feel like the most badass pregnant woman ever. Finally finally, a photo dump of my animals, because they’re cute. And everyone likes a blog with animal pictures. I haven’t written about the book much lately. I guess it’s kind of been playing second fiddle to everything else that’s been going on around here. Luckily, I was wrong on that front, and when I spoke to her yesterday, she did like the direction I was going in. We finally laid out a plan of action concerning how the rest of the year is going, and she wants me to try to have a first draft done by November before the baby comes. That will leave only editing and revisions after the baby comes, which–though I will really have to push to find the time–is doable. It has to be. But I figure, this is going to be my job, and I’m lucky enough to not have to go back to my day job after the baby comes, which frees me up to work on this even if it’s just an hour a day. It will get done. A first draft completed this year also means potential publication by next year–so that’s exciting. Considering I was signed by this agency last October and then had such a long pause due to Hurricane Sandy, it really feels good to finally have a potential end date on this project floating around. The other benefit to having an editor is they seem to magically know exactly where you needed to go when you were totally stuck. Some of the suggestions she gave me yesterday really left me going “oh jeez, why didn’t I think of that in the first place?” She gave me tons to think about as far as characterization and side plots go, which is something I was really struggling with. Formulating a novel is harder than you might think. It isn’t just–this is my plot and these are points A, B, C, and D. There’s so many side points and arcs and other bits of meat that fill in the skeleton. So I’m still working on that but I have a feeling a lot of it will come as I’m finishing up the first draft. That’s how it’s worked in the past anyway, when I was working on my own schedule. So now comes the part where I wade through all the ideas, stick to a few, and really put my nose to the grindstone. I’m filled at once with some really exciting ideas and a looming sense of dread and self-doubt about the whole thing (can I really finish this novel in 3 months?? )…but that must mean I’m a writer. It’s finally spring in Estes Park! From above, before they finished putting the railings and the stairs on. Brody was a great helper. We FINALLY have some space outside to store things. Mt. Meeker & Longs Peak…still lots of snow up there! I can’t explain what happened when I took this picture. It was like for the first time I finally felt that “wonder” of being pregnant. Up until now I had kind of been feeling…I hate to use the word indifferent, but that’s what it felt like. 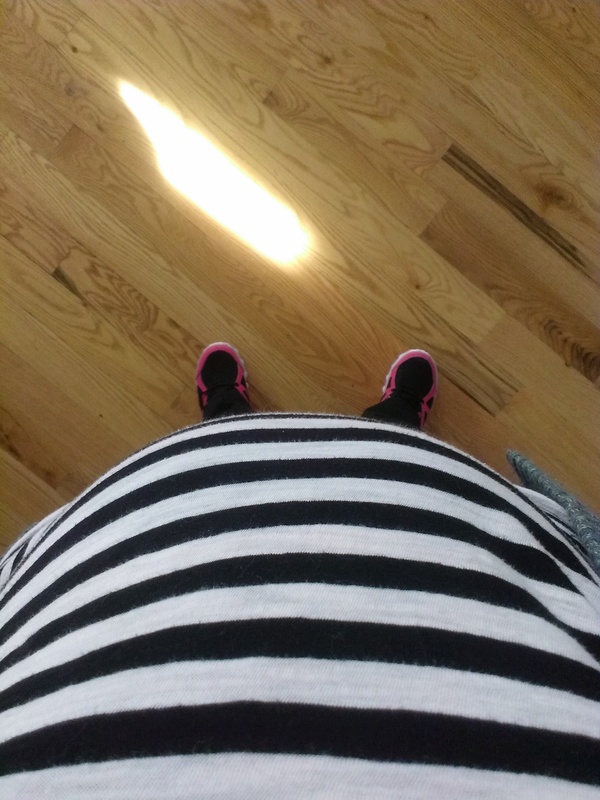 The belly felt like fat, I didn’t feel a connection to this thing that is supposedly in there, and I was just beginning to feel frustrated that this pregnancy so far seemed…boring. So maybe it was that I needed a change in perspective rather than just looking down at this bulge from above that just looked like too many donuts to me. But for the first time I finally felt actually, legitimately pregnant. It was an awesome feeling. If you’re any sort of creative type, you know that the muse to create–write, paint, sing, act, cook even–is not ever-present. Fickle, even. She operates much like weather patterns in the sense that her comings and goings are often tides that take years to come and then go out again. When I was in college, there was nothing to keep me from writing. I wrote so much when I was in school. At least four novel-length books that are currently waiting on my computer to be revisited, reworked, and hopefully some day find their way into the world. I wrote in between classes, during classes, until 3 in the morning, constantly. The summer I worked on the entertainment crew at the amusement park in Denver I was working 10 hour days (plus working at the renaissance festival, for a total of roughly 60 hours a week) and I would still sneak up to the booth in between shows and write during pre-show. And the simple truth was that I had to. Had to write. I was so full of ideas and the muse was definitely with me during that period of time. I was not beyond canceling plans with friends to stay home and write. And the crazy part about this is that I was so busy during these few years, mostly with school work. My senior year I was completing multiple theses at a time and I still finished the novel that ended up catching me an agent. After I got out of school that manic drive to write kind of faded a bit. I spent several months after I graduated in preparation for sending my novel to agencies. A lot of editing and re-editing. But I was trying to work on new material too, a sequel that probably now will end up being finished much later on down the road than I originally anticipated, due to the new direction my agents have me going in. But it seemed like the harder I tried, the harder it was to work. I bounced back and forth from project to project but was never able to get a whole lot of work done on any of them. Sure, there was a lot going on in my life–I moved 3 times in 14 months, got married, changed jobs 3 times, and now am having a baby–and while I was always busy before, it was a different kind of busy. It wasn’t working 40 hours a week and trying to keep up with a household and find time to spend with my husband. (And actually, throughout 4/5 of my college career, when I got so much writing done, I was single. It does tend to make a difference.) Now, though I am working on a new track and I can sort of see the light at the end of the tunnel (well…make that, I can see the tunnel) with this new project, it’s still hard to make myself sit down and work. By the time I get home from work (especially these days) I am exhausted and don’t have the brain space left to try to work on the book. I try to write at work when it is slow but often it’s difficult to get in a flow when I am being interrupted by customers. I know it’s only going to get worse once the baby comes so I am trying my best these days to really buckle down and get stuff done. I know it’s possible to do all of these things and still have a writing career. It must be or else nobody would ever write books. The trouble is finding the balance between work, life, and writing. The reason I was inspired to write this post is because I was listening to some music at work earlier and several songs came up that used to be my go-to inspiration songs. I would make playlist after playlist that described scenes and characters and situations in my books, and just listening to them would put me in the right direction. It also got me nostalgic about the years I had in college when my biggest responsibility was a couple pages of homework. I could stay up as late as I wanted and write all night and still sleep in until my afternoon classes. I miss being in school. The routine suited me and my creativity far better than this whole working-to-pay-bills thing. Plus, let’s not forget the benefits of being in school on stimulating my brain. Because I was in school, thinking, reading, it made my brain work harder. Luckily, I am not going back to work after the baby comes–so though it will be hard, I will make this work. The life of the stay at home mom writing on the side has been a coveted one for several years and I’m very happy that I’ll finally be able to do that, even if it requires some figuring out. I do finally have a good direction to go in with the new book. It’s been numerous false starts and rewrites with my editor but I think (“think” being the key word here) that I finally have a good idea of where I am going. We changed the tense and the person (is that the term for it? Basically I went from first person to third person.) It’s much different than I was anticipating but I like it, which is the most important part, so I’m hoping to get a few more pages behind me this weekend. Look what the Better Half did last weekend! He raised money for the St. Baldrick’s Foundation with several other Starbucks baristas and managers in the area and together they raised over $5,000. Of course in the meantime he looks like a convict, but it’s for a great cause I don’t complain. That much. Spring is still hinting here in Estes Park. We’ve had some mild days but nothing terribly warm so far. We had our first really good snowfall of the year (er, winter…since last winter) last weekend and it was great. Thick, heavy, wet snow like we have needed all year. Still it will be nice to have some warmer weather soon, I’m very excited to start opening the windows and letting fresh air in. Maybe start going after a garden. It’s so hard to gauge what the weather is going to be like up here in the mountain climes! Anyway, we don’t celebrate Easter (except for celebrating the sales next week!) but if you do I hope you have a pleasant weekend. I know I am still remiss on posting about Hawaii….I will do that soon, I promise…. This new novel has been giving me such a fight. As a writer, I rely on seeing the story in my head and putting the words on paper. But it’s been almost impossible for me lately to see this new story I’m supposed to be writing. It’s just not there. And I don’t know why, or where it is, or how long it will take me to see it. Needless to say, it’s been frustrating. It’s been hard to find direction or figure out how I should tackle the beginning…I haven’t even been able to jump around from place to place as the pieces come together. None of it is there. I know it will come eventually, and normally this wouldn’t be an issue, but for some reason I feel bad for not getting anything done. I haven’t been put to any specific deadlines yet, but as in the past, I feel like I will frustrate my editor if I am not moving as fast as I should be.